I was delighted to be able to attend the Winter Gardens Open Day for the first time. I have visited some parts of the building before but there were a good number of areas that I haven't had access to. The Open Day is run by the Winter Gardens Civic Trust. 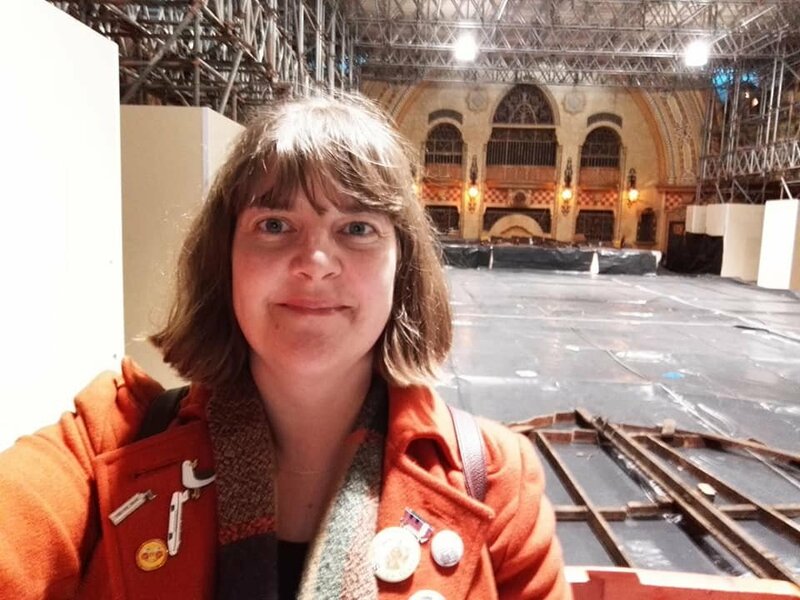 I was able to visit the Opera House (including backstage and on stage) Empress Ballroom, Arena, Olympia, Floral Hall, Galleon Bar, Renaissance Room, Horseshoe and my favourites the Spanish Hall pictured (currently being restored) and the Baronial Hall. Blackpool is so lucky to have such incredible seaside heritage! 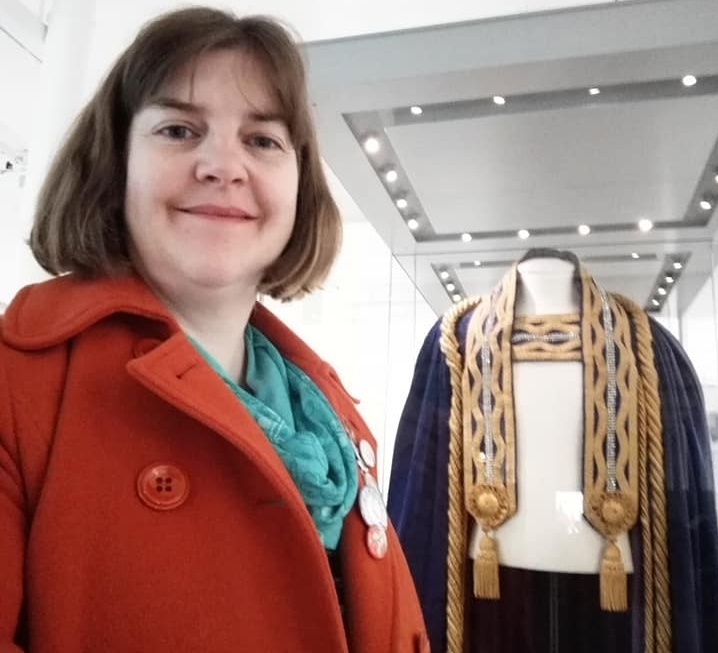 I recently visited the Queens of Industry exhibition at Leeds Industrial Museum, Armley Mills. The exhibition highlights the history of having Railway Queens, Cotton Queens, Wool Queens and Coal Queens. I knew Audrey Mosson, the Railway Queen who switched on the Blackpool Illuminations in 1935 (and again with actress Joanna Lumley in 1985) featured, but I was completely surprised when I saw they had the gown Audrey wore at the ceremony on show. They had the Railway Queen chain of office and tiara too! I was absolutely thrilled to see these pieces of history up close. The gown looked as good as new and the tiara twinkled in the light. The exhibition is on until September 2019. 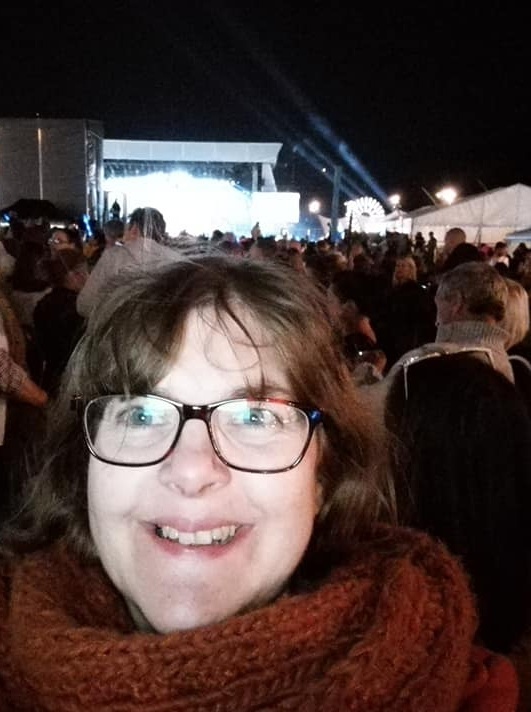 The Seaside Switch, my Blackpool children's book, was inspired by discovering that in 1935, Audrey Mosson a 15-year-old girl was asked to do the Illuminations Switch-on. Audrey, who had been crowned the Railway Queen, was the second 'star' asked to press the button. I have had the great pleasure of seeing the Illuminations many times and have been up close to the Switch-on button, but I had never been to the actual Switch-on ceremony. So I was delighted when I won wristbands for this year's show. Unlike rainy 1935, the weather was warm and dry although I'd wrapped up just in case! In 1935 the Illuminations Switch-on took place in front of Blackpool Town Hall. More recently the spectacular has taken place on the Tower Headland where the comedy carpet is. Security was high and a large area bordered off in front of the Tower for the event. There were tents selling drinks and food as well as mechandise. The entertainment lasts for hours nowadays and includes performances by pop stars and dance acts. This year the Illuminations were turned on by classical singer Alfie Boe who is from Fleetwood. The countdown was so exciting, then when Alfie pressed the button a huge cloud of confetti burst and the lights illuminated including the Tower. Moments later fireworks shot out from the top of the Tower. It was brilliant! The town was bustling with families. Isn't it fantastic that this tradition continues to be so popular! The Seaside Switch features a conjurer so as part of my research I have been reading Hiding the Elephant a fantastic non-fiction book about the history and art of magic. I have also watched lots of youtube clips of magicians including some showing how the illusions work - though even when you know how the trick is done, the skill involved is still mesmerising! The one thing I have never done is go to a proper magic show. Luckily Blackpool offers a few of these and is even home to a Magic Convention in February! I decided to get tickets to see The Evolution of Magic at The Horsehow Bar, Pleasure Beach. 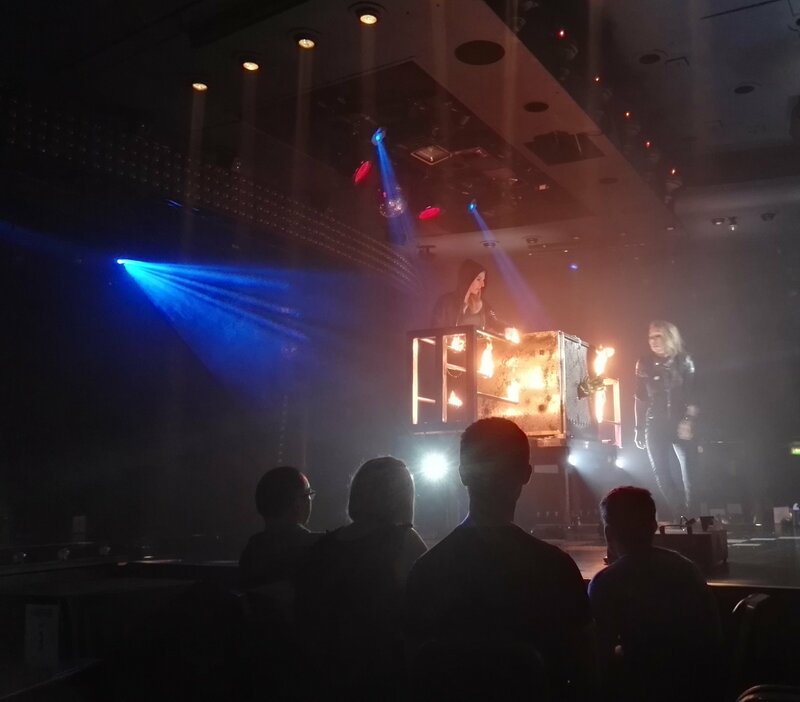 We had great seats and the show was fantastic, a real mix of northern humour, impressive close up magic (coins, cards) mind reading and bigger illusions. My favorite moments where when the magician Craig Christian made doves appear from nowhere and when he made his partner Elizabeth disappear from a chair. I also enjoyed the levitation and their version of a woman cut in half! Elizabeth also mind read my date of birth! It really was a magical night. After lots of editing and feedback I have now completed my Blackpool set upper middle grade novel. I have also changed the title to THE SEASIDE SWITCH. I am now working on a new Blackpool book currently titled Trouble at the Tower. This has meant several more trips to Blackpool, including the local history centre where I have been using the microfilm readers to look at the Blackpool Gazette. I haven't done that in a very long time! My new book sees my main character becoming a local newspaper journalist - which is the job I used to have a long time ago! It's been a real trip down memory lane thinking back to my days as a reporter. Of course I couldn't write a book set in the Tower without making a few trips there myself. I have been to the top of the Tower, ventured into the dungeon where the aquarium used to be, and watched the circus. I was also lucky to be able to join a tour of the Tower with the Blackpool Civic Trust. 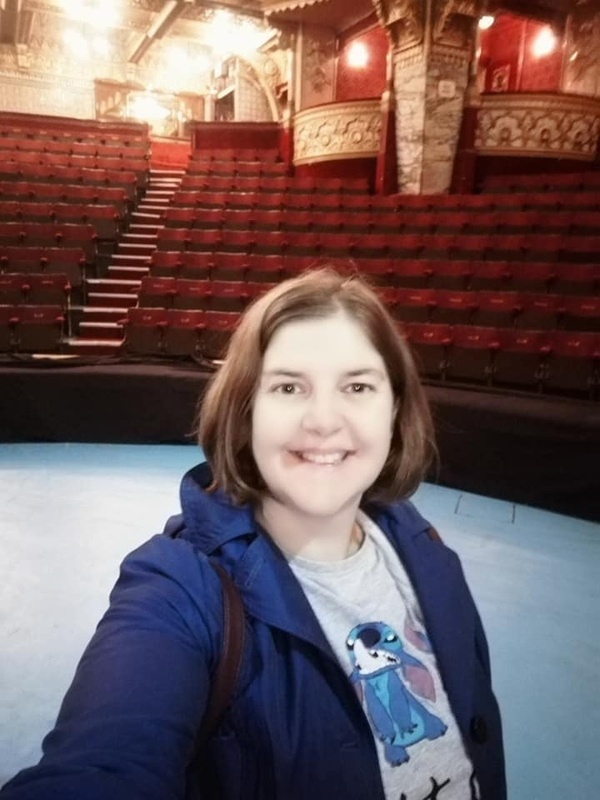 I was able to step into the circus ring and venture below where the animals used to be kept as well as seeing where the roof gardens used to be. It really is the most incredible building and is so inspiring. I have spent the last six months working on a new historical Middle Grade novel - The Seaside Switch, set during the illuminations switch on in 1935. I have loved taking several trips up to Blackpool to research my new book. As well as using the newspaper archives at the local history centre I've visited Blackpool Tower ballroom and I have been on some of the Pleasure Beach's historical amusement park rides including the Grand National, Hiram Maxim's Flying Machines (pictured) and the River Caves - which I have realised was the inspiration for my first books as it features a number of exotic locations including Angkor!) I have also travelled on a heritage tram! I have enjoyed a fantastic heritage tour of Lightworks - the purpose built depot for the repair, building and storage of the Blackpool Illuminations. There was a host of lamps, wiring, tableaux and illuminations to be seen as well as machinery and a chance to see an archive of old drawings. 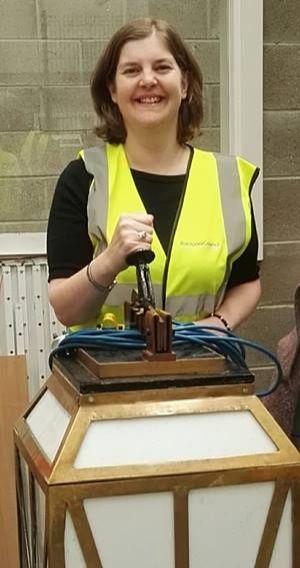 The highlight for me was having a chance to see the Switch-On column and I even got to hold the lever. The Column has been used since the 1930s and was the one used by Audrey Mosson, the 15-year-old Railway Queen who was invited to switch on the 1935 Illuminations! She looked far more glamourous than I did in my Hi-vis safety jacket though! I have very recently completed the first draft of a new children's book inspired by the discovery of the okapi at the beginning of the 20th century. Liberty and the Unicorn Trap is my fourth historical novel for children aged 10+. 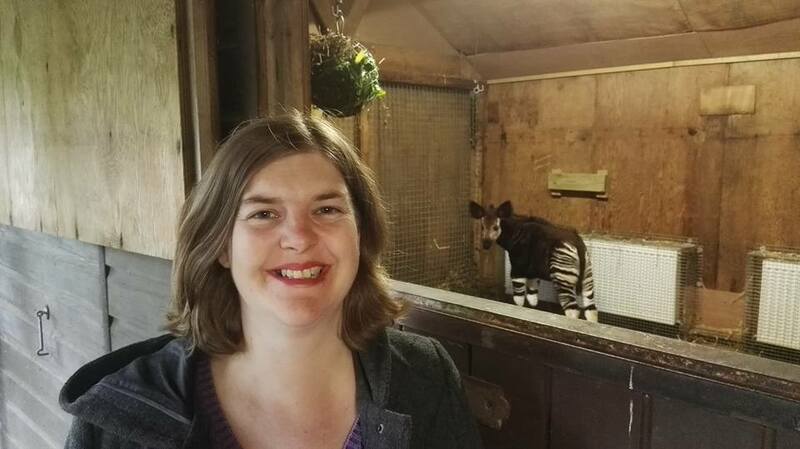 As part of the research I have been on an Okapi and Red River Hog experience at the Wild Place Project in Bristol. I got to meet Kibibi a female okapi, her calf, Ruby who was born in May, Lodja another female who is heavily pregant and Kivu a four year old male who was less shy than the females. I fed the okapi and the zookeeper kindly answered all my questions. I also fed two cheeky red river hog brothers who chased each other round. The okapi is related to the giraffe and has a long blue tongue like their relative. The stripes on their hind is individual to each okapi. I had a brilliant day at the Wild Place Project and would highly recommend a visit to see these endangered animals. Here are two articles I have written for Words & Pictures. 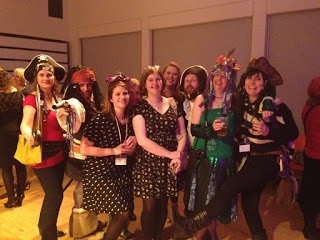 The first is about how my North West group celebrated 20 years of the Society of Children's Book Writers and Illustrators (SCBWI) in the British Isles. 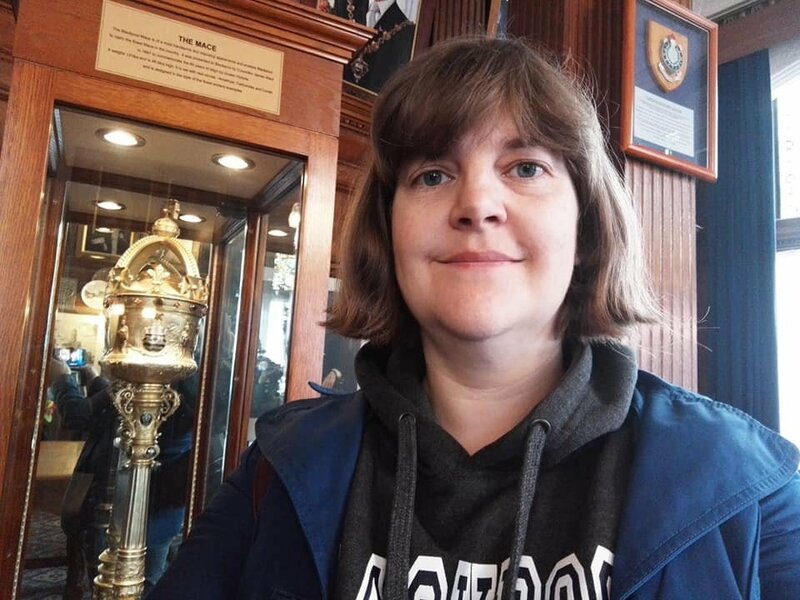 The second is a reflection on winning the Margaret Carey Scholarship last year and why I would encourage members of SCBWI to apply this year. 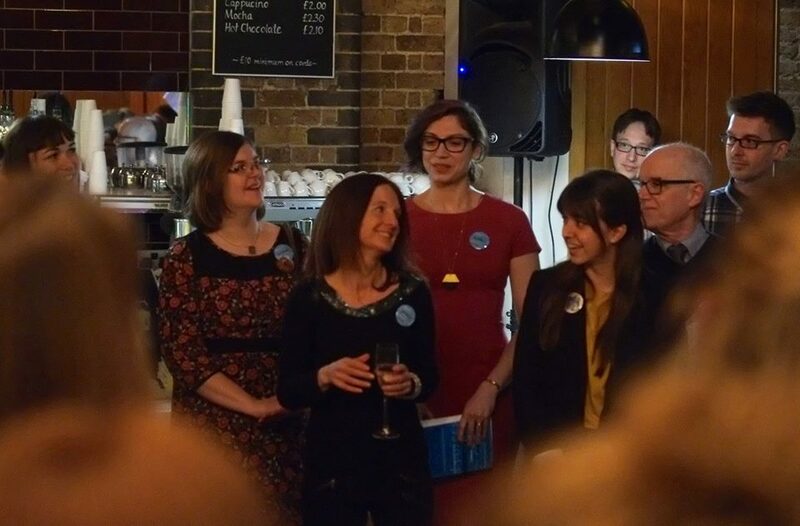 Last month, as one of the winners writers, I was invited to attend the launch of the Undiscovered Voices competition anthology. I was then invited to write an article sharing what my experience of the party had been for the SCBWI BI online magazine Words & Pictures. Here is what I wrote. Thanks to Candy Gourlay for the use of her photograph left. I am thrilled to be able to tell you that I have been chosen as a winner in the SCBWI BI Undiscovered Voices competition. I would like to thank SCBWI BI especially the UV team and sponsors Working Partners Ltd for organising a fabulous opportunity for writers and illustrators to be noticed. 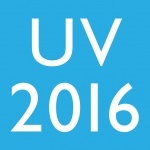 The winning opening chapters from the 12 winning writers and the winning 9 illustrations are available in the UV2016 anthology. You can download a copy for free or buy a printed book for £5.99 here. 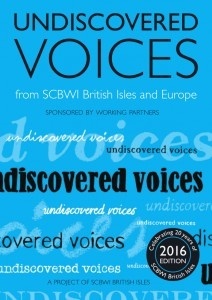 I am delighted to tell you I have been longlisted in the SCBWI BI Undiscovered Voices 2016 competition.This competition is for unpublished and unagented children's books writers and illustrators living in the EU. The shortlist will be announced in January 2016. I was delighted to win the Margaret Carey Scholarship and attend the SCWBI BI conference in Winchester. Very sadly while away I was given some sad news. Friendship helped me through a difficult weekend and I was glad that their support meant I stayed. I wrote an article for SCBWI Words & Pictures to say thank you. I am chuffed to announce that I have been awarded the Margaret Carey Scholarship 2015 for fiction. This scholarship is awarded by the Society of Children's Book Writers and Illustrators British Isles. 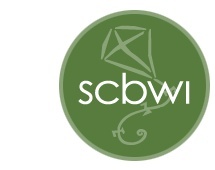 The news was announced on the SCBWI WI online magazine Words & Pictures. 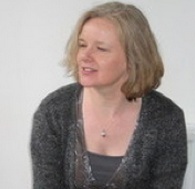 The award is made in memory of children's writer and illustrator Margaret Carey (pictured). The award is judged on a combination of writing merit and need. The first few lines of a book are often said to be the most important. SCBWI BI's Words & Pictures online magazine now run an Opening Lines challenge. I decided to send in the beginning of my The Girl Who Cried Owl book in for some feedback. Find out what agent Shelley Instone thought of my submission (no3) here.